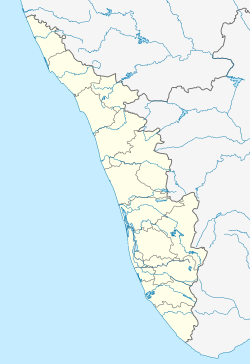 Kallumthazham (Malayalam: കല്ലുംതാഴം) or Kallumthaazham is a neighbourhood of Kollam city in Kerala, India. It is the 19th ward of Kollam Municipal Corporation. Kallumthazham comes under Kilikollur zone of Kollam Municipal Corporation where the maximum number of cashew processing factories located in India. It is the meeting point of two major national highways, NH-66 Bypass, Kollam and NH-744, passing through the city. It is to be considered as one of the major transport hubs in Kollam city. Famous Valiya Koonambaikulam temple is very close to Kallumthazham. Wikimedia Commons has media related to Kallumthazham. ^ "Lifeguards save man from drowning - The Hindu". 12 January 2016. Retrieved 31 October 2016. ^ "Council - Kollam Municipal Corporation". Retrieved 31 October 2016. ^ "Kallumthazham - Kerala Tourism". Retrieved 31 October 2016. ^ "30 reserved divisions in Kollam Corporation - The Hindu". 27 September 2015. Retrieved 31 October 2016. ^ "Welcome to the land of Cashews - Kollam". Retrieved 31 October 2016. ^ "Talks held on NH bypass completion - The Hindu". 7 December 2009. Retrieved 31 October 2016. ^ "Kollam bypass work comes to a standstill - The Hindu". 13 October 2016. Retrieved 31 October 2016. ^ "Ire over undue delay in Kandachira bridge work - The Hindu". 19 June 2015. Retrieved 31 October 2016. ^ "Roads Division, Kollam - Kerala PWD". 19 June 2015. Retrieved 31 October 2016. ^ "Chandra Pongal at Koonambaikulam - The Hindu". 3 March 2016. Retrieved 31 October 2016.